Porridge all day every day. [As I have recently rediscovered]. But even then, there is a time and a place. And summer solstice, at 34*C, is just not it. So here’s a little ‘recipe’ I’ve been dying to try since spotting it over on Spoon Cereals’ feed – upcycled granola dust. It’s still made from the same ingredients. Is it not? It’s still been baked. Has it not? Better yet, Juice Pulp Granola Dust has an added little shot of fibre from all that pulp. A little TLC [and help from The Collective Dairy and Alara Cereals Oats] later: breakfast of champions. Basically, it's gold. And you’ll wish you could buy the stuff. At least not toss the stuff! Promise? Side note: other positive outcome of this heat wave? The discovery of the possibilities of shooting on the roof–come-balcony-come-drain-with-wall-that-overlooks-street. And I am LOVING IT. Primrose Kitchen Beetroot Sprinkle [because I found some in the cupboard, it's nutritious, and it's pink]. Place all the ingredients into a clip-top jar [or tupperware]. Give a quick stir to incorporate, before sealing and placing in the fridge overnight. The next morning, take out half, and stir through additional yoghurt. 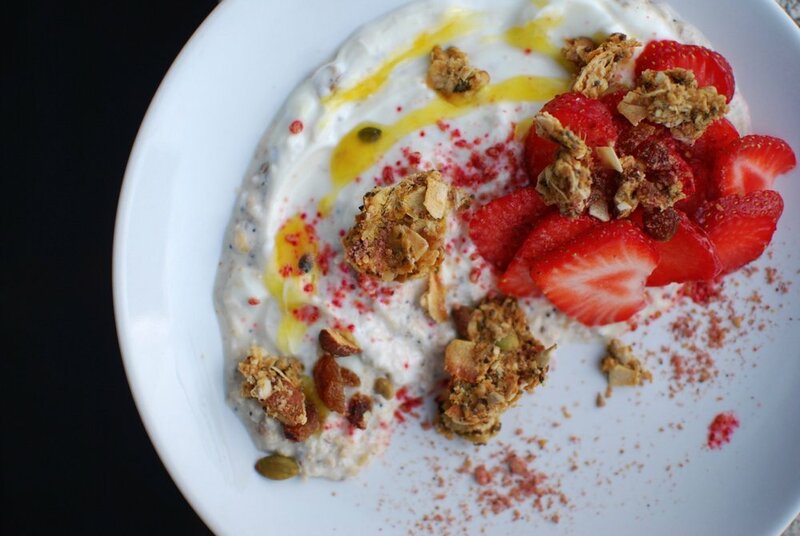 Top with strawberries, granola clusters and beetroot seed sprinkle. If you have an apple lying around, grate 1/4 of it into your jar along with the rest of your ingredients before refrigerating. Alternatively add a splash – 1 tbsp orange or apple juice. Top with any and all of the fruit you have lying around: smush up half a banana and mix through with additional yoghurt to serve, top with sliced mango, pomegranate seeds. Substitute dairy yoghurt with dairy free, for a different flavour (or intolerances): Coconut Collab plain yoghurt and Rude Health/Plenish nut mylks.